There are many advantages to using a token economy with your child with autism. Token economies help you to shape your child’s behavior by providing quick and motivating reinforcers. If done at home and on a limited scale, they can be easily and economically implemented. Additionally, your child’s participation in your token economy can help her or him develop real-world skills that will be applicable throughout her or his development. A token economy is a method of promoting desirable behavior through giving a child tokens that can then be redeemed for a preferred, rewarding activity, privilege or item. Token economies are based on positive reinforcement and can nurture the relationship between you and your child while motivating your child to behave in a desired manner. There is a large and growing body of research proving the effectiveness of token economies. To encourage the best results, your team of clinical professionals should support your efforts. Children should not have to work for their basic needs such as food, shelter, love and relaxation time. (However, snacks can be used as reinforcers.) Later in this article, we’ll get into how to choose the reinforcers your child is earning. Also, tokens, once earned, should not be taken away as a punishment for unwanted behavior. Rather, when undesired behavior arises, other strategies such as three-step compliance should be implemented. The first thing to do is identify the target behavior that you want to shape. For example, perhaps you want your child to do her math homework. The behavior should be defined, observable and measurable. So, “Sue will sit down to do her math homework for 20 minutes.” Alternatively, “Sue will complete all of her math homework.” Be realistic in what you are asking your child to do. Ask yourself, “Is my child able to do what I am asking?” Start with a few behaviors that are easy so that she associates the token economy with positive reinforcement. This will help your long-term success. Select the tokens. There are a number of different ways you can approach this. Tokens can be in the form of fake money, a sticker, ticket, coin or a tick on a checklist. There are a variety tokens and token boards you can purchase. To make your efforts increasingly motivating for your child, you can make your own tokens according to what your child likes. For example, if your child loves Elmo, with a printer, some Velcro and lamination you can create Elmo tokens! Determine what reinforcer your child is working for. The reinforcer that is chosen for your child to earn should be highly motivating for them. What is your child asking for? What does she enjoy doing? You can determine this by observing your child during playtime and looking for what she is drawn to. Alternatively, if your child is verbal, you can ask your child what they want to work for. In doing so, providing them with a few choices can help to clarify the most motivating and preferred items and activities. Perhaps your child loves watching cartoons, the reinforcer could be a half hour to watch television. As you and your family become accustom to using the token economy, you can vary the reinforcers. You can value reinforcers at different rates. The more your child values the reinforcer, the more expensive it can be, and the harder they will have to work to earn it. Figure out the ratio of exchange. This is a key element to the program. You will need to determine how many tokens each behavior is worth. If doing math homework for 20 minutes is challenging for your daughter or son, then you will need to give her or him a good deal of tokens to motivate her. Also, determine how many tokens your child needs to receive to get the reinforcer. We recommend that you start small and simple. At first, the number of tokens to earn the reward should be small. Over time, you can decrease the value of the tokens making it more challenging to earn the reinforcers. Establish where and when your child can exchange tokens. This provides added structure to the program, which can help nip problem behavior in the bud. Perhaps you want to give your child an opportunity to exchange her or his tokens, once a week, at a specific time and place. Explain if possible. If your child is verbal and can attend, sitting down with them to explain the token economy will encourage your long-term success. A good way to approach this is to explain what a token economy is, why it will help her or him and what is expected. Then, model the behavior. Start with something simple. For example, instruct your child to clean up their play space then take out their pajamas. Once done, they will earn two tokens for each activity, giving them four total tokens. When they earn the four tokens they get their reward of watching television for a half hour. Your ABA therapist may also use a token economy, may likely deliver the tokens more quickly to keep up the pace of the session. Your clinical team will determine the value of the tokens. Tokens are considered a conditioned reinforcer. So, that means that your child needs to begin to associate the reward with the tokens before the token economy system becomes effective. This way, the tokens, themselves, become reinforcing! Once your kiddo understands that she or he can cash in a certain number of tokens for a preferred item or activity, those tokens begin to have a value in the mind of your child. 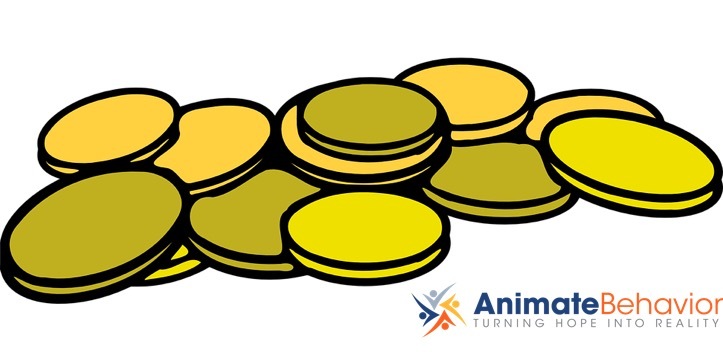 ABA therapists employ a number of procedures to “pair tokens with reinforcement.” Our experienced clinicians can provide you with more answers. These are a few tips on how to start a token economy, at home, with your child with autism. Your clinical team of ABA professional can help you manage and evaluate the effectiveness of the program. By nature, ABA is driven by data. Those data allow Animate Behavior’s clinical staff to make informed decisions about your token economy thus increasing its effectiveness. Click here now to reach out to one of our clinical directors for more information.